Beware of Fake-Antivirus "Win 8 Security System"
Late in August McAfee Labs discovered a Fake Antivirus program that claims to detect infections, and displays alerts to scare users into purchasing protection. On the contrary, this program is not genuine software and has nothing to do with reliable and effective AV tools. 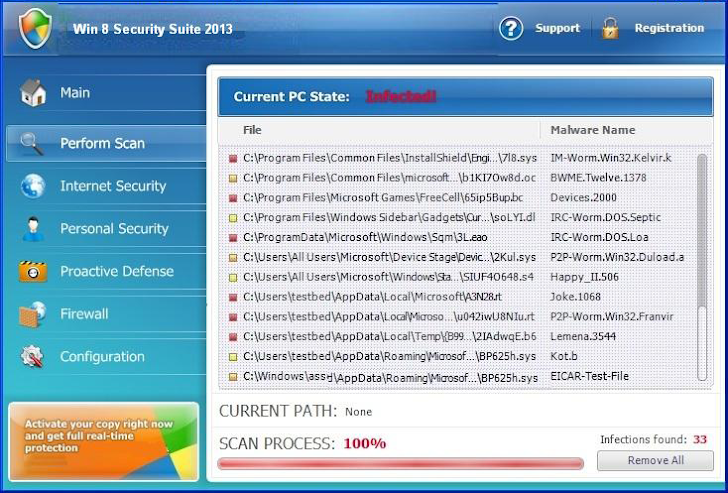 The truth is that this is another scam application developed to enter your PC through vulnerabilities in outdated programs. Trend Micro, which detects the threat as TROJ_FAKEAV.EHM said, ”After infecting a user’s system, this malware scares its victim into buying the “product” by displaying fake security messages, stating that the computer is infected with spyware or other malware and only this product can remove it after you download the trial version. As soon as the victim downloads Win 8 Security System, it pretends to scan your computer and shows a grossly exaggerated amount of nonexistent threats”. This sort of malware is commonplace, with examples existing for Windows XP, Windows Vista, Windows 7 and even Mac OS X. What’s amazing is not that the hackers have decided to use the Windows 8 name, but the fact that they chose to do this before Windows 8 is even out. Trend Micro’s conclusion about this threat is that, It is typical for cybercriminals to piggyback on the highly-anticipated release of any latest technology to take their malware, spam, malicious app to new heights. To stay safe, users must keep their cool and think twice before clicking links or visiting web pages especially those that promise the latest items or programs for free. If it’s too good to be true it probably is.